Scientific understanding of chemosynthetic symbioses derives in large part from studies of the unique fauna associated with deep-sea hydrothermal vents. Early explorations revealed that, in contrast to common perceptions, the deep benthos was not a cold, food-limited habitat but instead contained flourishing ecosystems localized at hot springs emanating from mid-ocean spreading centers. 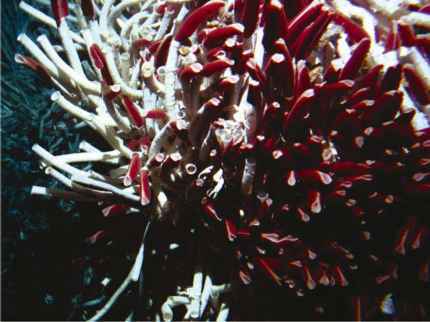 First characterized along the Galapagos Rift and the East Pacific Rise in the eastern Pacific Ocean, hydrothermal vents were shown to support high concentrations of free-living microorganisms and dense aggregations of invertebrates, including the vestimentiferan tubeworm Riftia pachyptila (Fig. 1; Lonsdale 1977; Grassle 1985; van Dover 2000). Scientists first argued that suspended particulate organic matter and free-living chemoautotrophic bacteria were being filtered from the water column to support the abundant invertebrate populations (Lonsdale 1977; Corliss et al. 1979). But studies soon revealed that the adult R. pachyptila lacked a mouth and gut (Jones 1981) and was therefore incapable of suspension feeding. It appeared that tubeworm nutrition, and therefore the flux of energy through the vent food web, instead depended substantially on endosymbiotic chemosynthetic bacteria. Initial evidence for a chemoautotrophic symbiosis in R. pachyptila came from microscopic and biochemical analyses showing Gram negative bacteria packed within the trophosome, a highly vascularized organ in the tubeworm trunk (Cavanaugh et al. 1981). Additional analyses involving stable isotope (Rau 1981), enzymatic (Felbeck 1981; Renosto et al. 1991), and physiological (Fisher et al. 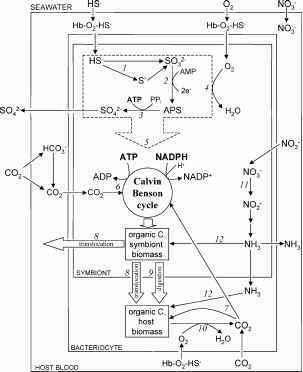 1988) characterizations strongly suggested that the endosymbionts of R. pachyptila oxidize reduced sulfur compounds (e.g., hydrogen sulfide) to synthesize ATP for use in autotrophic carbon fixation via the Calvin cycle (i.e., "thioautotrophy"). The host tubeworm enables the uptake and transport of the substrates required for thioautotrophy (HS-, O2, and CO2) and, in return, receives a portion of the organic matter synthesized by the symbiont population (Fig. 2). The bacterial population is the primary means of carbon acquisition for the symbiosis, and the adult tubeworm, given its inability to feed on particulate matter, is entirely dependent on its symbionts for nutrition. Discovery of this obligate mutualism prompted investigators to search for similar symbioses at vents and in other marine habitats (e.g., reducing sediments, hydrocarbon seeps). To date, chemosynthetic bacteria have been found in symbiosis with invertebrate hosts from six phyla as well as with ciliate protists (see review in Cavanaugh et al. 2005). Indeed, the presence of symbiotic bacteria is a defining characteristic of some taxa. For example, all members of the tubeworm family Siboglinidae examined to date, including the vestimentiferan (e.g., R. pachyptila) and the smaller pogonophoran tubeworms, contain intracellular symbionts. Members of this family occur not only at deep-sea hydrothermal vents (e.g., Oasisia, Ridgeia, Riftia, Tevnia sp. ; McMullin et al. 2003) but also at hydrocarbon cold seeps (e.g., Escarpia, Lamellibrachia sp. ; Sibuet and Olu 1998) and mud volcanoes (e.g., Oligobrachia; Pimenov et al. 2000; Gebruk et al. 2003). The symbionts of most of these worms are chemosynthetic sulfur oxidizers, but methane-oxidizing bacteria (methanotrophs) have been found in one host species, the pogonophoran tubeworm Siboglinum poseidoni (Schmaljohann and Flügel 1987; see following chapter). 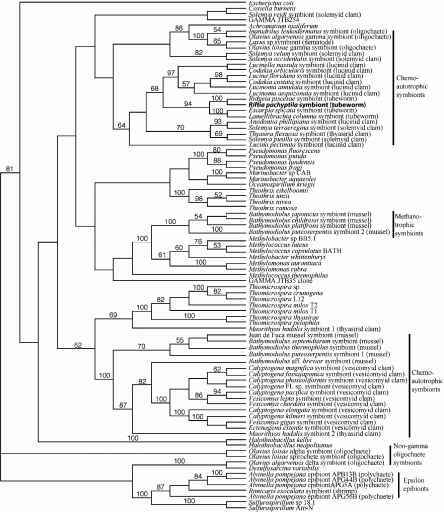 Based on analyses comparing 16S rRNA gene sequences, symbionts of the vent tubeworms fall within the gamma Proteobacteria, a broad bacterial division that includes chemosynthetic symbionts from a wide diversity of host taxa (Fig. 3, adapted from McKiness 2004; Cavanaugh et al. 2005). When compared to other chemosynthetic symbionts of the gamma Proteobacteria and to epsilon Proteobacteria episymbionts of shrimp and alvinellid worms, the 16S rRNA gene sequence from the symbiont of R. pachyptila clusters with sequences from symbionts of other tubeworms, including another East Pacific Rise vent tubeworm, Ridgeia piscesae, and two species of seep tubeworms, Escarpia spicata and Lamellibrachia columna (Fig. 3). This result supports prior studies showing that vestimentiferan tubeworms from hydrothermal vents share a single, or very similar, symbiont phylotype (Feldman et al. 1997; Laue and Nelson 1997; di Meo et al. 2000; Nelson and Fisher 2000; McMullin et al. 2003). Outside of this "tubeworm group," the Riftia symbiont appears most closely related to chemosynthetic symbionts of tropical lucinid clams (Fig. 3). Interestingly, both lucinid clams and vestimentiferan vent tubeworms appear to acquire their symbionts from a pool of free-living bacteria (i.e., environmental transmission, see Gros et al. 1998, 2003 and Section 14.4 below). However, the extent to which a free-living symbiont stage facilitates the invasion of multiple hosts (e.g., tubeworms and clams) over evolutionary time remains equivocal. For R. pachyptila, as for other marine chemosynthetic symbioses, much current research focuses on clarifying the mechanisms that mediate the environmental acquisition of symbionts as well as the transfer of carbon, nutrients, and sulfide within the symbiosis. These processes are vital to understanding the ecology and evolution of both the host and the symbiont. But elucidation of these mechanisms first requires knowledge of the physiochemical environment that determines the distribution and physiology of R. pachyptila.